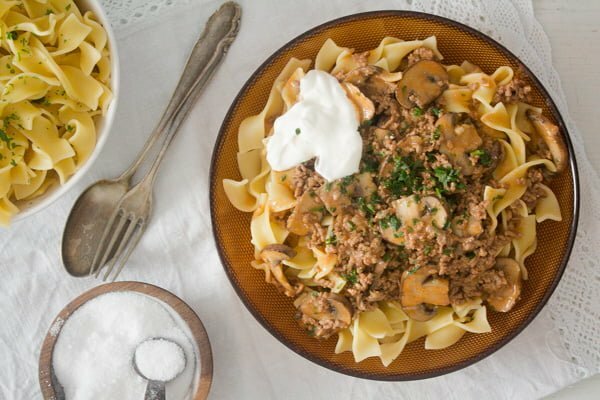 Easy ground beef stroganoff made from scratch. Only a few inexpensive ingredients like ground beef, mushrooms and noodles and you will have a perfect family dinner ready. This is one of those family meals, you can be sure you can please anyone with. Ground beef, noodles and a creamy sauce, who would say no to that? I have been making different kinds of beef stroganoff recipes for years now. 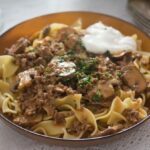 From the more expensive calf stroganoff (only once) to chicken or pork stroganoff, classic beef stroganoff with thinly cut beef strips and this very easy ground beef stroganoff. Actually, the ground beef stroganoff recipe is the one I cook most of the times. It is cheap, very easy to make and utterly delicious, my family loves this dish. OK, the children still refuse to eat the mushrooms and I refuse to give up the mushrooms, so they remove all the mushrooms slices from their plates before starting to eat, but clean up their plates afterward. As the name stroganoff suggest, this dish has Russian origins. It was originally made with strips of beef served with sour cream. 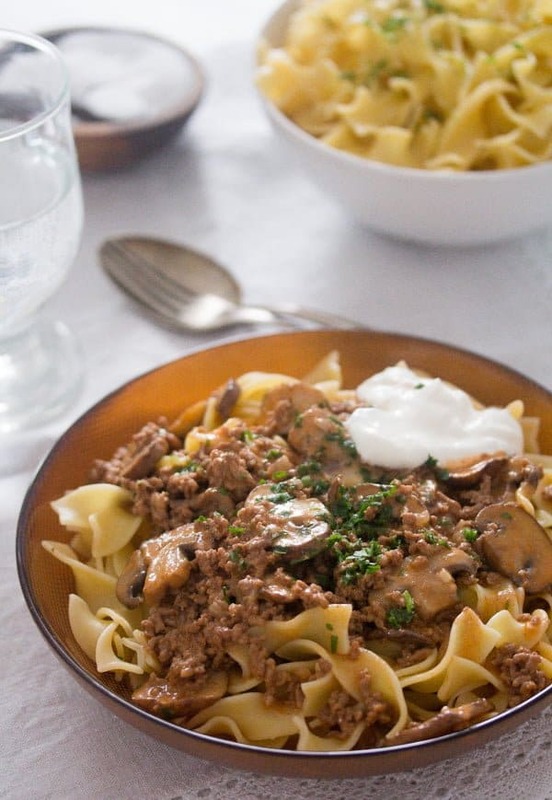 The original recipe included no mushrooms, but as the recipe developed and got famous outside of Russia as well, mushrooms started to be added to the dish and the beef stroganoff recipe became that what we know and love today. The first mention of beef stroganoff is found in a classic Russian cookbook “A Gift to Young Housewives” by Elena Molokhovets from 1871. The dish was cooked with beef cubes, served in a mustard and bouillon gravy containing a small amount of sour cream, but no onions or mushrooms. Later on, at the beginning of the 20th century, onions and tomato paste were added, making the dish more similar to what we know today. After the fall of Tsarist Russia and through the Russian immigrants, beef stroganoff became popular outside of Russia as well. Apparently, it first became popular in China before World War II and was brought to America by Chinese and Russian immigrants after the war. The current classic version of beef stroganoff is made with strips of beef in a sauce containing onions, mushrooms and sour cream. Traditionally, in Russia, it would be served with crisp, fried potato straws, but otherwise it is most commonly served with noodles or rice. I personally prefer to eat beef stroganoff with mashed potatoes, especially when cooking the dish with ground beef, but my kids prefer noodles in this case, so I stick to noodles most of the times. 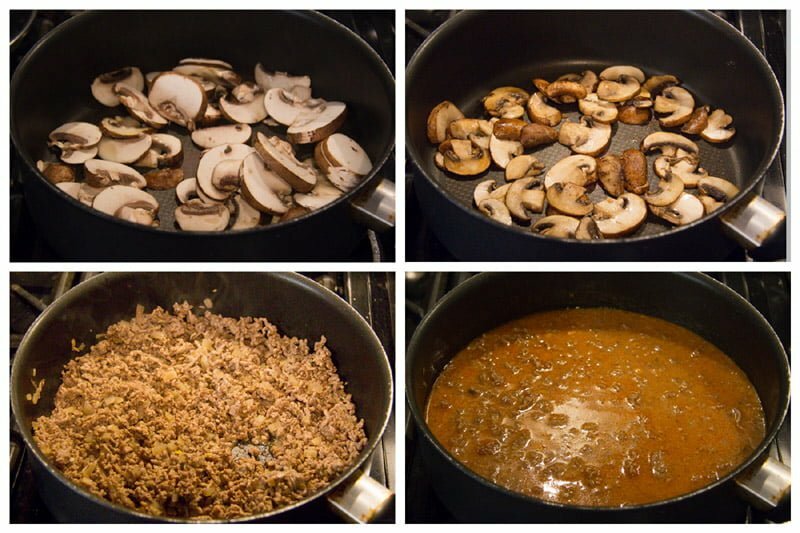 Ground beef: I use lean ground beef for this easy ground beef stroganoff. Mushrooms: definitely fresh mushrooms, either cremini or white mushrooms. If you use button mushrooms, you can leave them whole or only halve them, they will look very pretty in the dish. Sour cream: I use smetana or Schmand, which is widely available in Germany. If you can find a Russian or Eastern European store, do try smetana, it is delicious. Otherwise, regular sour cream can be easily substituted. I use only a small amount of smetana or sour cream, less than I saw in other recipes. I like it this way, I think it adds exactly the amount of smoothness to the beef stroganoff dish without making it too heavy. The sour cream or smetana can be added to the dish at the end of the cooking process or directly at the table, a small dollop on each plate. Stock: I use homemade stock, beef or chicken, mostly chicken. 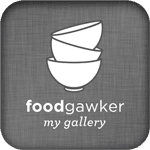 I almost always have chicken stock in the fridge or freezer. However, using homemade chicken or beef stock is not mandatory, a good quality brand or even bouillon cubes will do just fine. 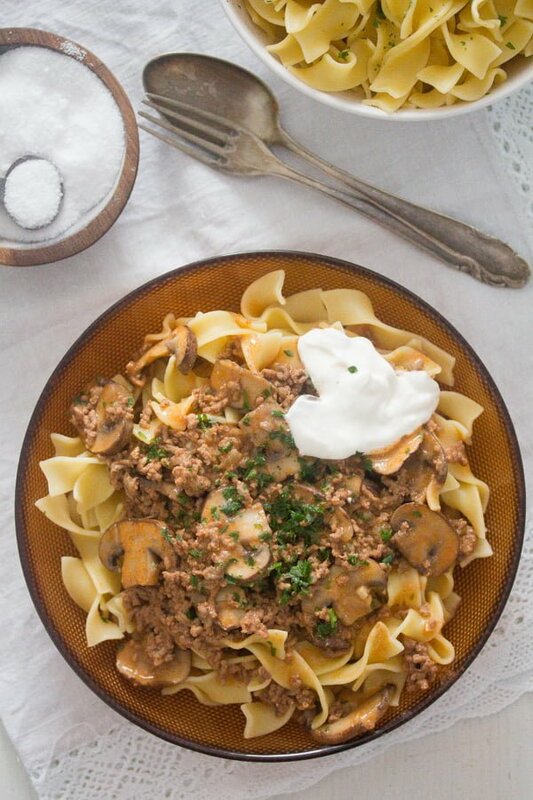 This ground beef stroganoff recipe is very easy to cook. Step 1: Slice and cook the mushrooms. I used cremini mushrooms this time, but white mushrooms can be used instead. Cook the mushrooms for about 5 minutes until nicely golden. Remove from the pan and set aside. Step 2: Cook the ground beef, onions and garlic until the onions start to get golden. Make sure to break all the ground meat lumps during this step. Step 3: Add the tomato paste, flour and water mixture (which is necessary to thicken the sauce), stock and Worcestershire sauce. Step 4: Simmer the beef stroganoff with ground beef for one hour on low heat. 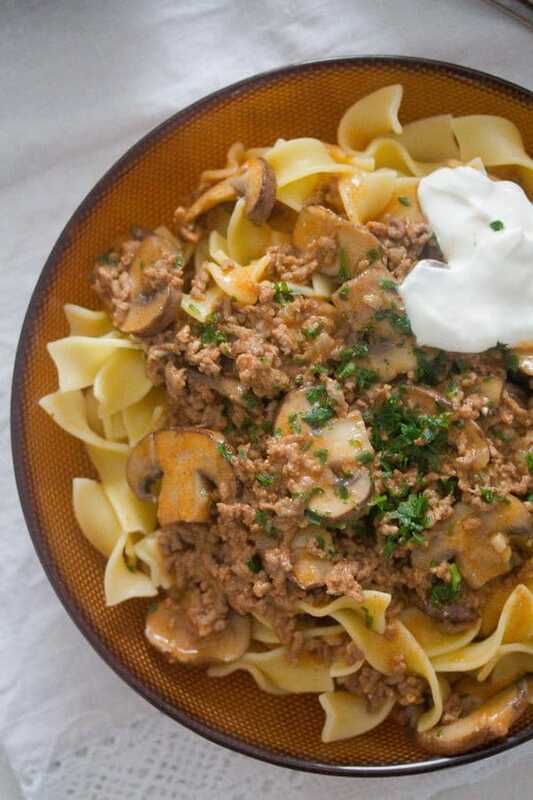 Many recipes instruct you to cook the ground beef stroganoff for a much shorter time, but I think this dish gains in flavor from being slowly cooked for a longer time. Step 5: Add the sour cream and stir well, don’t let the dish come to a boil anymore. 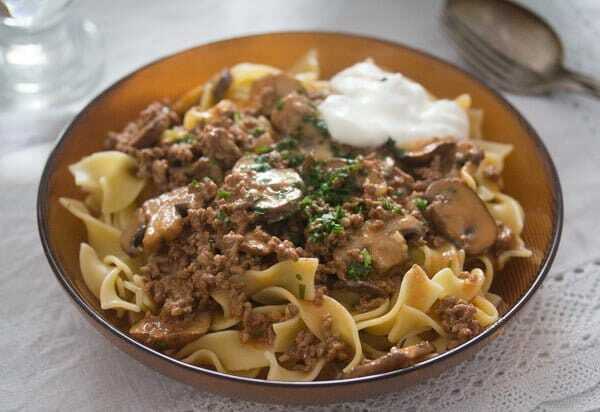 Serve the easy ground beef stroganoff with wide noodles (for instance tagliatelle), rice, fried straw potatoes or mashed potatoes. I like to serve some pickled vegetables on the side, but that is just my Romanian blood. A nice salad or sauteed vegetables like green beans, cauliflower or broccoli would do just as well. Clean and slice the mushrooms. Heat the oil or butter in a large pan (which has a lid) and fry the mushrooms for about 5 minutes or until golden brown. Remove to a plate and set aside. In the meantime, finely chop the onions and the garlic. Give them to the same pan and cook for about 4-5 minutes until the meat is brown and the onions slightly golden. Break the lumps of meat using a wooden spoon during this time. Whisk together the flour and the water. Give the mixture to the pan together with the chicken or beef stock, tomato paste, Worcestershire sauce, salt and pepper. Mix well. Turn the heat down to low, cover the pan and simmer for 50 minutes, stirring from time to time. Add the mushrooms to the sauce. Continue simmering for 10 more minutes, without the lid, the sauce should thicken slightly. Stir in the sour cream or smetana. Don't let the dish come to a boil again. Sprinkle some chopped parsley over the ground beef stroganoff and serve with noodles, rice or mashed potatoes. 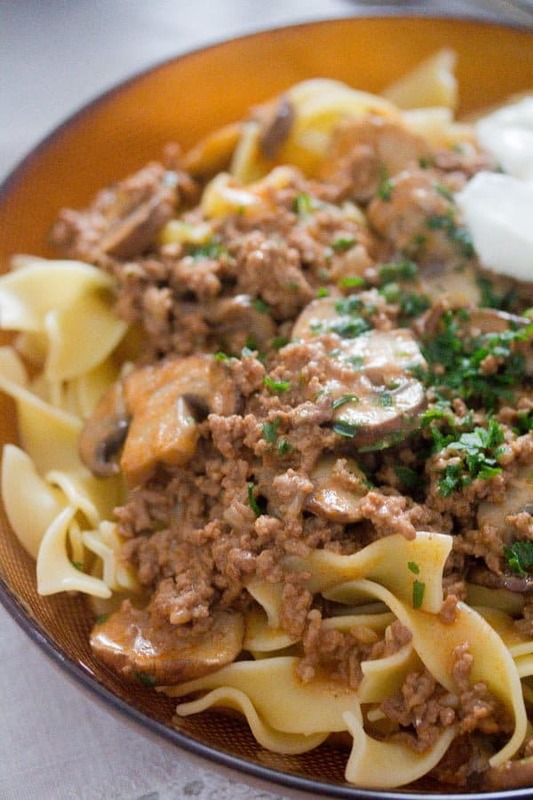 Such a great idea of using ground meat to make this classic! I can’t wait to try it.